Shönu Drub was born in a farmer’s house at Nyang in Tibet. He became a monk at the age of ten before the abbot Chimpa Yidshin Norbu and took full ordination at the age of twenty. Under the guidance of the teacher Lokyawa he excelled in learning. At the age of twenty-one he stopped his intellectual studies and approached the Sakya lamas to get tantric teachings for actual attainments and considered both the words and the meaning that those teachers expressed. As unfavorable conditions arose within the Sakya community, Shönu Drub paid his final visit to Jangsem Kungzhon. Leaving Sakya, he proceeded to meet the great ascetic master Dampala from whom he got several ascetic practices such as Cutting the Thread, which can overcome all obstacles. 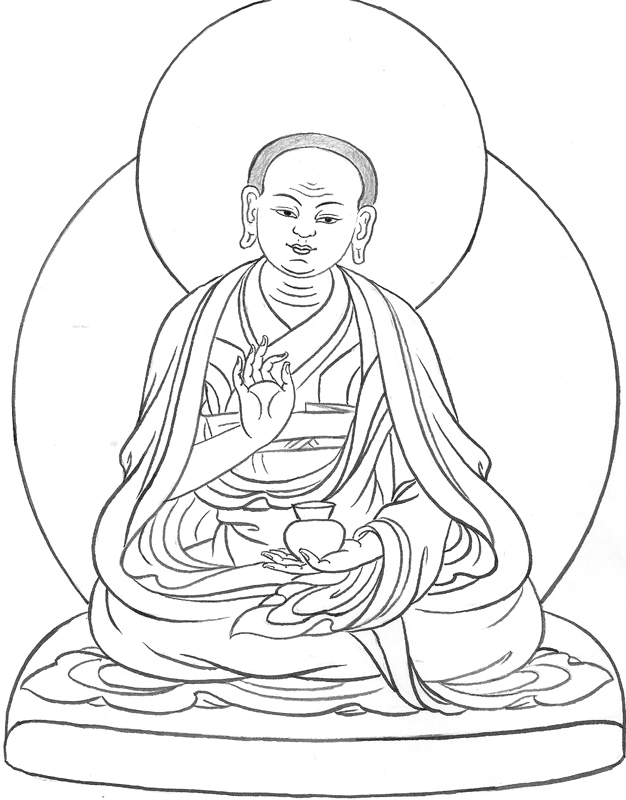 Shönu Drub received several cycles of teachings from Lama Lopön Gelong. 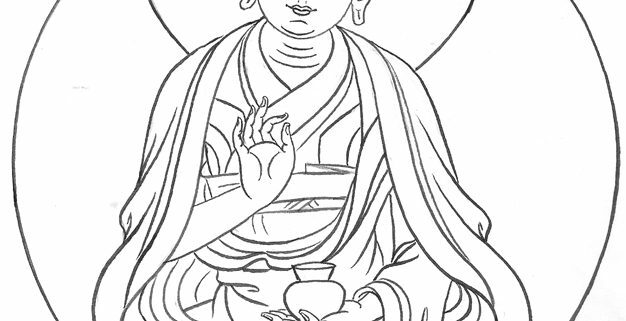 Shönu Drub learned about Sangyé Tönpa from Lama Kamchenpa and great faith and devotion arose in him. With strong feelings Shönu Drub set out for Central Tibet to meet Sangye Tönpa and requested him to grant the empowerment of Illusory Body. Sangye Tönpa gave the complete instructions on the Six Doctrines because Shönu Drub was very special and worthy of receiving these profound teachings, which were not taught to ordinary students. Sangye Tönpa gave all the instructions of the lineage including the Five Tantric Deities, the Six Yogas of Niguma, Mind Deathlessness and Non-Deviation, Mahamudra, oral instructions of the Dakpo Kagyü, Drikung Kagyü, Drukpa Kagyü, Tsalpa Kagyü and Sakya school as well as the teachings of Machik Lapdrön, to the worthy Shönu Drub, who diligently and steadily practiced and mastered all the teachings he received from Sangye Tönpa and so many other teachers of different lineages. Before Shönu Drub passed away, he gave away all of his possessions and went into retreat. At his death all kinds of miraculous omens appeared near and far. Dakinis could be heard singing in the sky. Khetsün Shönu Drub either came from, or even established the famous Samding monastery (bsam sdings) in western Tibet, the later seat of Tibet’s most famous female incarnation lineage, the Samding Dorje Phagmo (bsam sdings rdo rje phag mo), which originated with the famous Chökyi Drönma (1422-1455/6), who was a student of both Bodong Panchen Chogle Namgyal (1375-1451) and Drubchen Thangtong Gyalpo.